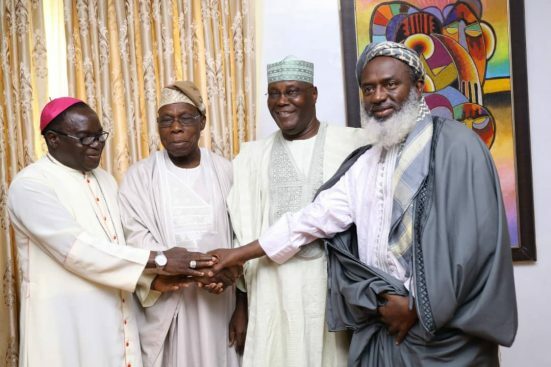 General Overseer, Living Faith Church Worldwide, Bishop David Oyedepo and Bishop of the Roman Catholic Diocese of Sokoto, Matthew Hassan Kukah, alongside other scholars, have joined a closed-door meeting between former Nigerian president, Olusegun Obasanjo and the presidential aspirant of the Peoples Democratic Party (PDP), Atiku Abubakar. Dailytrust reports that the meeting which took place at former President’s residence at Olusegun Obasanjo Presidential Library (OOPL), Oke-Mosan, Abeokuta involved top members of government in the country. Atiku was Obasanjo’s Vice President between 1999 and 2007, but seems to have been torn apart considering former President’s repeatedly declaration that he would not support Atiku’s presidential ambition. Atiku upon arrival at the library for the meeting with his entourage at 1.07am on Thursday went straight into the meeting. Others present at the meeting were former National chairman of PDP, Uche Secondus, Governors of Ogun, Gbenga Daniel, Cross River States, Liyel Imoke, Senator Ben Bruce, Ahmad Gumi. 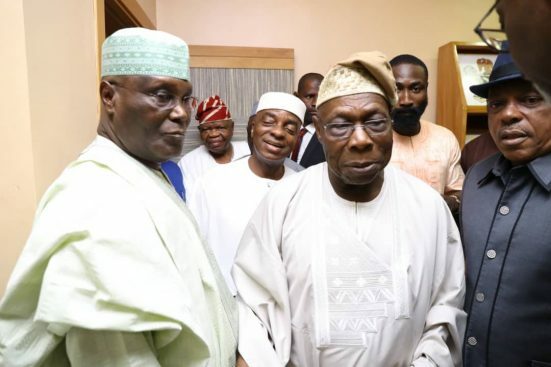 In Obasanjo address at the meeting, he said that Atiku had learnt lessons from past errors and had made amends as required. “Yes, when it started, it was meant for Atiku to succeed Obasanjo. In the presence of these distinguished leaders of goodwill today, let me say it openly that we have reviewed what went wrong on the side of Atiku. And in all honesty, my former Vice-President has re-discovered and re-positioned himself. “From what transpired in the last couple of hours or so, you have shown remorse; you have asked for forgiveness and you have indicated that you have learnt some good lessons and you will mend fences and make amends as necessary and as desirable,” he said. Former President stated that like Christians who ask God’s forgiveness, he has forgiven Atiku, adding that he had reconciled with the party and that is why he is the presidential candidate of the party. However, since the meeting, Bishop Oyedepo had been trending on social media.